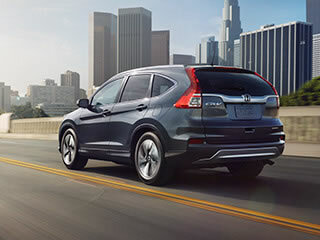 The CR-V kicked off the crossover vehicle segment, and ever since its debut, it has been leading the charge as one of the top family vehicles on the market. 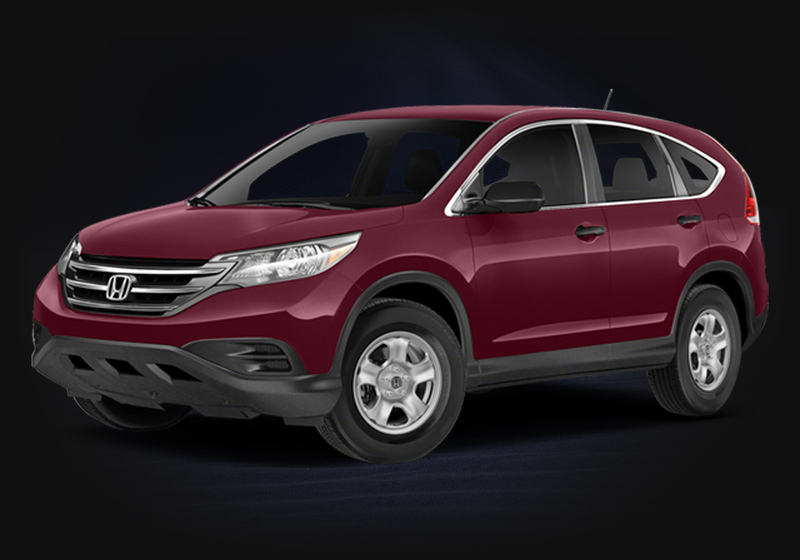 The 2015 Honda CR-V is one of the most versatile vehicles of its kind, with room for up to five, plenty of cargo space, a powerful and fuel-efficient engine, and smooth contours that give the vehicle a look all its own. With four different trim levels and your choice of two- or all-wheel drive, Honda’s crossover is built to fit the needs of the modern family. While few will need the CR-V to regularly deliver the power of a small truck, Honda has engineered its 2.4L four-cylinder engine to do just that. Updated for the 2015 model year, the CR-V’s powertrain is both more powerful and more efficient than the 2014 models, and the crossover comes with a variety of features that let you get the most out of that new engine. 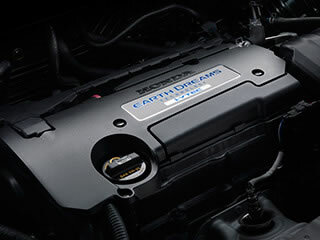 Honda’s new 2.4L Earth Dreams four-cylinder engine delivers 185 hp and 181 lb-ft of torque, while taking advantage of variable valve timing and variable timing control to reach peak torque and max horsepower at lower RPMs for a more efficient engine. It also lets the CR-V tow as much as 1,500 pounds in a pinch. It used to be that your transmission would often have to settle for a less-than-ideal gear ratio, but the continuously variable transmission changes that. A CVT is able to deliver the ideal gear ratio at all times for improved efficiency and smooth acceleration without giving up an ounce of performance. 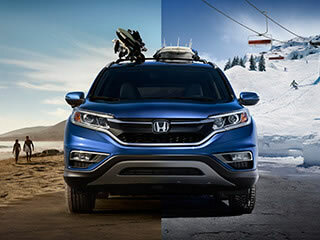 Available on every trim level, Honda’s Real Time All-Wheel Drive automatically senses a loss of traction and sends power from your engine to the rear wheels to offset the loss and let you keep a solid grip on the road. Drive with confidence through snow, mud, and rain, knowing that the CR-V has you covered. When you lift your foot off of the brake pedal, Hill Start Assist lets the CR-V maintain the pressure in the brake line until it feels you press the accelerator. 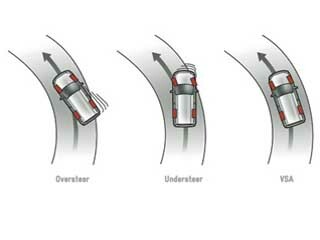 That means you’ll have no worries about slipping backward or sliding when you’re parked on a steep hill or driveway. The toughest part of building an engine is making sure as much power as possible gets transferred to the wheels. The G-Design Shift works with the CVT to help give you a more enjoyable driving experience with reduced engine revving by transferring as much of that 185 hp as possible to the wheels. 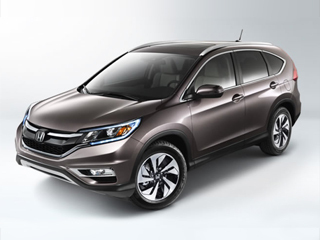 The CR-V has always been one of the most fuel-efficient models in its class, and the 2015 model year has gotten even better. The EPA-estimated highway fuel economy of 2015 CR-V 2WD models dwarfs the competition, helping reduce the environmental impact of driving your crossover. 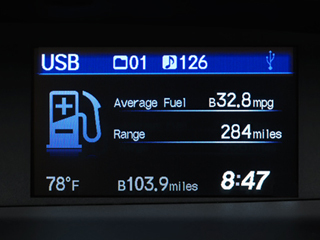 The Eco Assist feature even helps adjust your driving habits for maximum fuel efficiency! Honda is a brand known for their safety, and that is never truer than on their family vehicles like the CR-V. Not only does it feature some of the best and most advanced in traditional safety amenities, but Honda’s new Touring trim level has next-generation safety technology that is designed to help prevent collisions before they even happen. Imagine being able to back up with a crystal clear and unobstructed view of what’s behind your vehicle. 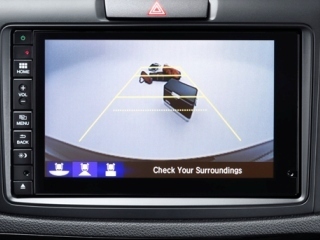 Now imagine that unobstructed view along with all of the parking advice provided to help you back-up perfectly, and you have the standard rearview camera system found on every CR-V. You won’t know how you lived without it. 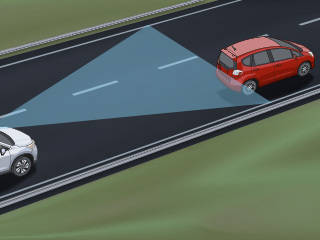 Vehicles are getting smarter and smarter these days, and Honda’s Collision Mitigation Braking System uses a radar mounted on the front of the CR-V’s grille to detect how close you are to the vehicle in front of you, and whether you may be at risk of a collision. First it will warn you, then, if needed, it can apply the brakes directly. By tracking the markings on the road, a small camera mounted on the CR-V’s windshield can tell if you’ve started to drift from your lane without signaling. Visual and audio warnings can both be delivered to alert the driver to the drifting and keep you from leaving your current lane. By deploying and inflating quickly, SmartVent airbags are able to cushion you and your passengers in the event of a collision, protecting your upper body. These airbags are designed to be able to vent before fully inflating to provide just enough force and help reduce the risk of airbag-related injuries. It’s no coincidence that Honda’s body structure is referred to as ACE. 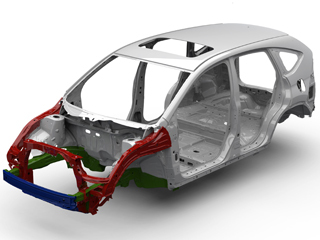 Built to the highest standards for auto safety, the ACE body structure has crumple zones that help reduce the risk of injury in an accident and a design built to redistribute crash energy equally among all vehicles in a collision. 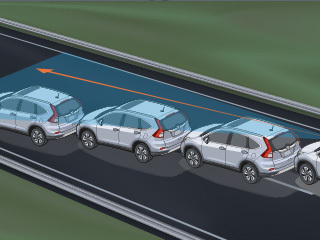 By braking individual wheels or even reducing engine output, Vehicle Stability Assist is able to correct for over or understeer and keep the CR-V going in a straight line, reducing the risk of spinning out on tough terrain. When combined with traction control, it also reduces the chance of wheelspin while accelerating. The CR-V is not only an impressive looking vehicle on the outside; it is smoothly contoured and features some of the latest in automotive technology. With seating for up to five in 104.1 cubic feet of passenger space, as well as an easily expandable rear cargo area, the CR-V has room for the whole family—and the gadgets to keep you all entertained on a long drive. 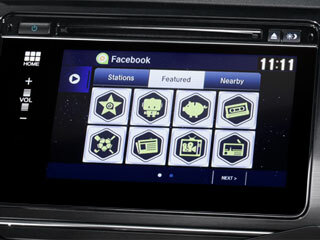 This next-generation infotainment system gives you direct access to social media, news, radio, audio books, and even personalized restaurant recommendations, and it’s all powered by Aha with an intuitive app-based interface. 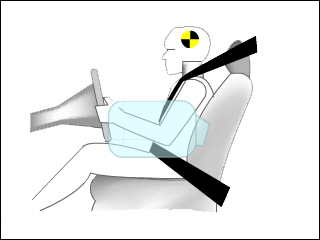 It can even request emergency assistance in the event of an accident when the driver is incapacitated and/or the airbags have been deployed. Whether you want to know what your fuel efficiency numbers are like or what song is playing through the streaming Pandora internet radio, you’ll find it on the CR-V’s intelligent Multi-Information Display (i-MID). The i-MID will even display SMS text messages to you, so that you can always stay connected. 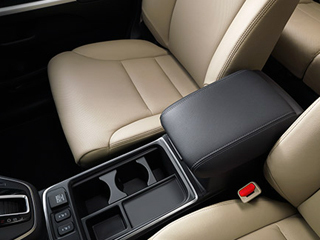 The CR-V is designed to take advantage of every cubic inch of space, and that means your center console is built to do double- or triple-duty. Two USB audio interfaces let you plug in and play/charge up to two devices, adjustable cup holders have room for your coffee, and the rear vents direct heat/air conditioning to rear passengers to keep everyone comfortable. Turn-by-turn navigation may be one of the best available features on a modern vehicle. Honda’s satellite-linked system ensures you’re always headed in the right direction, while also helping route you around traffic jams and road closures. 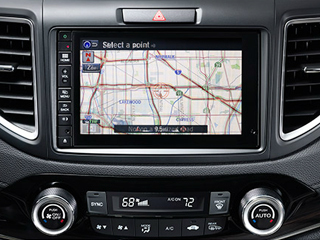 Upgrading to navigation also gives you access to voice-controls for the in-vehicle infotainment system. Pandora internet radio lets you design custom radio stations of your favorite artists—and artists Pandora thinks you’d like—and if you invest in a premium account, you’ll enjoy all of that music commercial free. 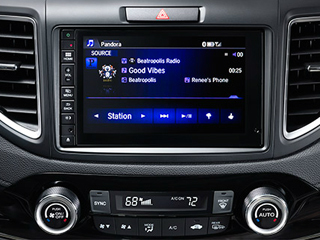 Your Honda’s stereo system is designed for Pandora, letting you give a song a thumbs-up or a thumbs-down and improve your station while on the road. No need to ever fumble for your keys again; the CR-V can detect when your key is in the car. All you need to do is press down the brake pedal and push the red “engine start/stop” button to bring your crossover to life. 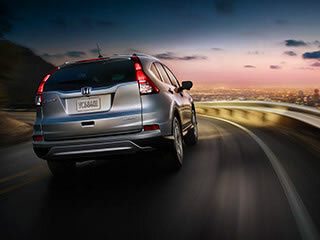 There are few vehicles that look as stunning as the 2015 Honda CR-V, but those curves are for more than just good looks. Honda’s crossover has aerodynamic curves that let it cut through the air and reduce wind resistance, and the 18-inch alloy wheels give the vehicle a sleek look and feel, while also offering a lower weight than traditional steel wheels. The CR-V is just as much about style as it is substance. In the case of the vehicle’s exterior, the aerodynamics reduce the crossover’s drag coefficient and give it a sleek, modern look. While some crossovers’ roof racks are just for show, the CR-V’s are ready to be loaded up at a moment’s notice for the next family road trip. Smart Entry combines with push button start to keep you from ever needing to fish for your keys. 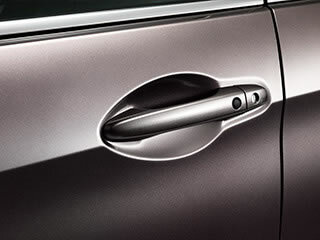 The CR-V EX and above will know when your key fob is nearby, and then you can enter by grasping the door handle. Need to lock up? Just press the small button on the handle, and you’re good to go. 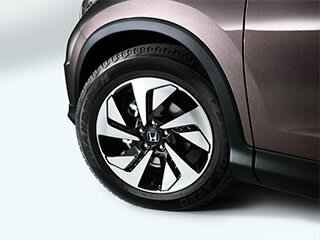 Lightweight and durable, aluminum alloy wheels are better than steel wheels in almost every way, and the brand new 2015 Honda CR-V Touring is the first of Honda’s crossovers to bring 18-inch alloy wheels to the table. They have a unique design that helps give the crossover an even sportier feel. 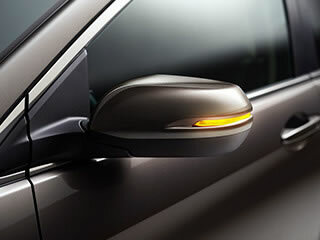 Integrated directly into the CR-V Touring’s side mirrors, these turn signals give other drivers another reminder of where you’re heading to help them stay out of your way. 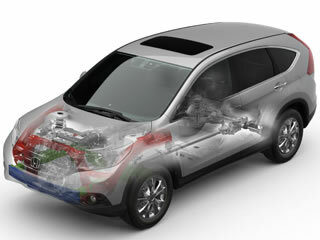 They also give the crossover a high-tech, almost futuristic look that matches the features of the cabin. 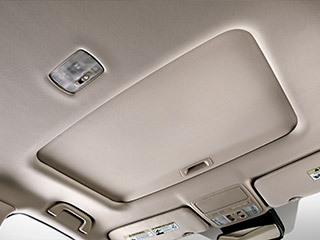 Give yourself a breath of fresh air on a nice day by opening up the power moonroof and letting mother nature into the CR-V. The sliding sunshade lets you get the fresh air without the sun, and it just takes one touch for the moonroof to go from closed to tilt to open. 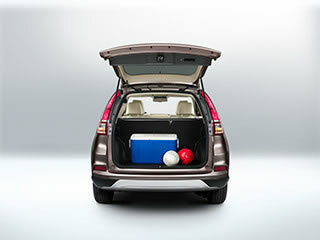 Open or close the CR-V’s tailgate from up to 50 feet away on the Touring model. No more juggling grocery bags while you try to unlock your tailgate; the power tailgate can be unlocked and open by the time you reach your vehicle by just pressing a button on your keys. *MSRP excluding tax, license, registration, $790.00 destination charge and options. Dealer prices may vary.